Students looking for online colleges in Colorado can find dozens of options. The National Center for Education Statistics (NCES) reports that 87 colleges and universities are based in Colorado, which includes 28 public, 17 nonprofit, and 42 for-profit institutions. This includes institutions like the University of Colorado at Boulder — the state's flagship public research university with an enrollment of more than 34,000 students — and the small Nazarene Bible College in Colorado Springs. Students interested in pursuing community college online or in-person in Colorado can also choose from 34 two-year institutions. The following guide introduces prospective learners to the best online colleges in Colorado. It also provides a general overview of higher education in the state, including the prevalence of online learning in Colorado. Aspiring students can also read about job prospects for college graduates in Colorado and peruse a sampling of scholarships available to online students in the state. Before looking at the best online colleges in Colorado, this guide provides a summary of higher education in the state, including online education. Students looking for institutions of higher learning in Colorado can choose from a variety of options, including public, nonprofit, and for-profit schools. As of the 2015-2016 school year, the NCES reported that Colorado housed almost 90 colleges and universities, enrolling more than 350,000 students at degree-granting postsecondary institutions. The cost of earning a degree represents a primary concern for many prospective students who hope to find cheap online colleges in Colorado. CollegeBoard reported that the average in-state tuition during the 2018-2019 school year for four-year, public schools in Colorado was $11,140. The state’s flagship university — the University of Colorado at Boulder — charged slightly more than average for in-state tuition ($12,532). Additionally. out-of-state learners paid almost three times the amount as in-state students ($37,286 per year). However, many schools offer online students in-state tuition rates, regardless of where they live. Students attending online colleges in Colorado can qualify for a variety of financial aid opportunities. In the 2015-2016 academic year, Colorado students received almost $169,000,000 in financial aid to help offset the cost of a higher education. Undergraduates benefitted from the vast majority of this funding, receiving more than $160,000,000, while graduate students were awarded the remaining funds. This money went to students who demonstrated financial need as well as to learners who qualified for aid based on merit and other non-need-based eligibility criteria. According to a recent online learning survey carried out by the Babson Survey Research Group, 114,448 students — or 32.5% of the total student body in Colorado — took at least one online course in 2015. The amount of students taking Colorado online college courses slightly outpaces the national average of 29.7%. Nearly 21% (73,745) of survey respondents took all of their classes online, including 53,636 undergraduates and 20,109 graduate students. Of the students taking all of their courses online, 29,078 (or 39.4%) live in Colorado, while the rest live out of state. The high cost of out-of-state tuition can give prospective students pause. However, the Western Interstate Commission For Higher Education (WICHE) helps make tuition more affordable for students residing in Western states who want to go to school outside of their home state. Established in the 1950s, this regional organization helps higher education systems in Western states share resources. Fifteen states participate in WICHE, including Colorado, Alaska, Arizona, California, Hawai’i, Idaho, Montana, Nevada, New Mexico, North Dakota, Oregon, South Dakota, Utah, Washington, and Wyoming. Some U.S. Pacific Territories and freely associated states also participate. A major component of WICHE’s work includes its Western Undergraduate Exchange (WUE) program. WUE helps students save money on tuition, ensuring that they won’t need to pay more than 150% of in-state tuition rates at an out-of-state, participating academic institution. Although not every program at participating schools qualifies for this exchange, hundreds of degree tracks do. Students who participate in WUE receive an average nonresident tuition discount of $9,000 each academic year. More than 160 colleges and universities (both two-year and four-year institutions) participate in WUE, including 23 on-campus and online colleges in Colorado. Students can locate participating academic programs by using WUE’s savings finder. The rankings below list the best online four-year programs in Colorado. These profiles look at how schools approach online education and include the services provided to distance students and a school’s popular, fully online degrees. After reviewing the best online schools in Colorado, students can explore additional state resources, such as a database that contains every college and university in Colorado and an index of popular in-state scholarships. CSU operates as the largest public university system in the state, and it opened its Global Campus in 2007. Based in the Denver suburb of Greenville Village, CSU Global offers online bachelor's and master's degrees and web-based degree completion programs. Bachelor's programs include accounting, communications, criminal justice, healthcare management, information technology, and organizational leadership. Students may also choose to pursue one of the school's nine certificates, in areas such as cybersecurity, marketing, and networking. This online college in Colorado holds accreditation from the Higher Learning Commission. Some specific degrees hold additional programmatic accreditation. For instance, CSU's accounting degree holds accreditation from the Accreditation Council for Business Schools and Programs. The number of major-related credits students need to take varies. The human services major, for example, requires students to take 45 credits within the major, whereas a criminal justice and law enforcement degree requires only 30 major credits. Students must complete 31 credits of general education requirements before jumping into their majors. Learners take courses from five foundation content areas, including writing, math, and science. They can easily transfer those credits to any other Colorado public university. CSU Global also offers student support services, such as career counseling, financial planning, and tutoring. The college runs all of these programs from the university's physical campus, with digital resume building tools, 50-minute calls with career coaches, and video seminars on handling stress. Distance learners also receive full around-the-clock access to the school's online library. To apply for undergraduate programs, prospective students should possess a high school diploma or a GED equivalent. Although the school previously only accepted candidates with previous college credits, it began considering all prospective students, including first-time freshman, in winter of 2018. If applicants have already completed some higher education, they should hold at least a 2.3 GPA in previous college coursework. The main campus of CSU calls Fort Collins home. The university enrolls over 33,000 students in both graduate and undergraduate programs. Located near the Rocky Mountains, CSU values its reputation one of the nation's most sustainable colleges. More than 10,000 of CSU's students enroll in online courses each year, either for a major offered entirely online, for online certificates, or for individual classes. CSU's online arm administers 10 bachelor's degrees in diverse fields, including agricultural business, fire and emergency services, horticulture, and natural resource tourism. Like their on-campus peers, students enrolled in this online college in Colorado must complete 120 credits of coursework in order to graduate. Online learners need to earn 42 credits of upper-level coursework, and at least 32 of those credits should come from CSU-Fort Collins. The school holds regional accreditation from the Higher Learning Commission. In addition, people interested in specific subjects, hobbies, or general personal enrichment can take non-credit classes through Fort Collins' online branch. Non-credit-earning students might enjoy courses such as how wildlife shaped humanity, pairing wine with the person, not the food, or introduction to flytying. Students who live in or close to Fort Collins can take advantage of the campus amenities, even if they do not attend on-campus classes. Additionally, all students receive access to the university's online resources, like digital writing guides and web consultation sessions from the school's writing center. CSU also invites online students to walk at the university's commencement ceremonies. Prospective students for distance learning programs need to meet the same requirements as on-campus students. In short, applicants should apply with a high school diploma or GED equivalent. Although the university does not dictate minimum scores for standardized tests, the middle 50% of successful applicants held ACT scores between 23 and 29 and SAT combined scores of between 1120 and 1300. Located in Colorado's Mile High City capital, DU operates as a private research institution. Although Methodists originally founded the school in 1864, the university no longer holds religious affiliation. DU offers students master's programs and bachelor's completion programs through its online college in Colorado. Students may choose from five bachelor's completion programs, including communication arts, global commerce and transportation, global studies, information technology, and leadership and organizational studies. The format of these bachelor's completion degrees does not allow students to complete all of their required credits through DU. Students must already hold at least 40 credits of previous higher education experience. Courses last 10 weeks each. Students must enroll in 11 common core courses and 10 major courses. Core courses provide an introduction to a subject area; in communications, for instance, students take core courses like effective communication and a writing workshop. Major courses delve deeper, allowing students to really explore their chosen subject. Communications students complete research and integrated projects. Students may also take electives, although the number of electives depends on the amount of previous course credit they have earned. Online students can choose to pursue their degrees either through an asynchronous format -- which means they can log on and complete coursework at any time -- or through "HyFlex" courses, which allow them to tune into on-campus courses in real time. The university encourages students to schedule one-on-one meetings with their instructors, through Skype sessions, phone calls, Canvas chat, or even in person if students live close to Denver. To apply to the bachelor's completion programs, prospective students need at least three years of work experience after graduating from high school. They should possess previous college credit, and they should demonstrate solid written language skills. Past higher education experience must come from accredited institutions. Founded in 1877 by a group of exiled Jesuit priests in Las Vegas, Regis moved to Denver a decade later. Regis continues to hold its Jesuit affiliation. A century and a half after its founding, over 12,000 learners now study at Regis. The school also ranks as one of the best online colleges in Colorado, offering numerous master's, bachelor's, and certificate programs entirely online. Undergraduates can study such diverse fields as cybersecurity, healthcare administration, criminology, or elementary education. The bachelor's in business degree allows students to choose between human resource management, general management, marketing, and project management. The education degrees also equip students with initial licensure, so they graduate prepared to teach. In addition, Regis holds accreditation from the Higher Learning Commission. Undergraduate degrees require students to complete between 120 and 128 credits. Undergraduate students can transfer in up to 90 credits from previous higher education experience, which allows those learners to graduate in half the time. Regis also awards credit for certain work experiences or certifications. Students may also enroll in blended degree programs if they like, attending on-campus classes on weekends or evenings in addition to their web-based courses. If students want to enroll in a class not offered by Regis, they can take those courses online through Regis' partner institutions through the Online Consortium of Independent Colleges and Universities. Application requirements vary by program. All prospective students should possess a high school diploma or GED equivalent. Some programs require personal statements or recommendation letters, and others expect students to have met a minimum GPA requirement. Some programs -- like criminology, marketing, or the RN-to-BSN program -- follow a structure that assumes students have already taken some higher education courses. Online students can help pay for tuition costs by applying for scholarships and grants. UNC has educated students in the city of Greeley since 1889. Nearly 13,000 learners attend this public school. Although the majority of students enroll full time, the university also offers programs for students who prefer to study online or pursue their degrees part time. The school welcomes first-generation college learners. In fact, 40% of the school's students are the first in their families to attend college. The university offers eight bachelor's degrees: ASL and interpreting, communication studies, counseling and psychology, dietetics, teaching, special education, nursing, and sociology. Students can also choose emphasis areas within those majors. For instance, the sociology program presents emphasis areas in family; inequality and institutions; deviance, crime, and delinquency; and social psychology. Graduate students can earn a master's degree or doctorate at UNC in areas like education and psychology. The bachelor's programs fall into a few different categories. Students who began their higher education elsewhere may pursue bachelor's completion programs. Several of the school's undergraduate programs fall under the "bachelor's with licensure" category, meaning students earn both a degree and a license once they finish their studies. Students can also earn second bachelor's in nursing degree, which requires 71 credits of coursework and lasts only 20 months. All of the school's other bachelor's programs expect students to complete 120 credits. Students may also earn graduate or undergraduate certificates at UNC. Undergrads might opt for a certificate in brewing laboratory science or criminal investigation, for instance, and graduate students can pursue teaching and nursing certificates. On top of that, the university runs several educational licensure programs, including one for those who wish to teach American Sign Language. The school holds regional accreditation from the Higher Learning Commission. As another public school, the UCCS enrolls all sorts of students. About 12,400 students attend the school, and its online arm allows distance learners to pursue degrees in communication, criminal justice, sociology, philosophy, business administration, and health sciences. The school also offers master's degrees in nursing, engineering, and a few other areas of study. In addition to the bachelor's programs listed above, the university provides students with a couple of other unique undergraduate options. For one, nurses can take part in the school's dual enrollment RN-to-BSN program. Designed for students already pursuing their associate degrees at Colorado community colleges online or on campus, this program allows students to simultaneously work on earning their BSN and RN license. Learners who the prefer the social sciences can enroll in the school's dual degree in sociology and criminal justice. While other degrees require students to earn around 37-39 credits in their major area of study, this dual degree pathway allows learners to take 25 criminal justice credits and 34 sociology credits. The school holds regional accreditation from the Higher Learning Commission. In addition, the RN-to-BSN nursing program holds accreditation from both state agencies and the Commission on Collegiate Nursing Education. To apply, prospective students must hold a high school degree or GED equivalent. The RN-to-BSN program requires applicants to hold at least a 2.5 GPA in previous college courses, the business program requires transfer students to hold at least a 3.0 GPA, the criminal justice and sociology programs require a 2.4 GPA, and the healthcare sciences department mandates a 2.5 GPA. Transfer students can bring in a maximum of 72 credits from two-year colleges or a maximum of 90 credits total. As its name suggests, CCU operates as an interdenominational Christian-affiliated private school in the Denver suburb of Lakewood. With a student body of about 8,500 students, CCU offers associate, undergraduate, certificate, and graduate programs fully online. The school's bachelor's degree options include Bible studies, early childhood education, and organizational management. Many of the education degrees also prepare students for licensure. All bachelor's degrees require students to complete 120 credits of coursework, but the specific expectations differ for each program. Typically, students spend 36-39 credits in major requirements, 40-45 credits in general education courses, and 30-40 credits in elective courses. Courses last five, seven, or 10 weeks, depending on the program. Some majors also allow students to choose an emphasis area. For instance, the information technology degree offers concentrations in database management and networking. CCU also gives credit for "life learning experiences" through its prior learning credit program. Students may earn credit for certain skills through exams or a portfolio. For instance, a student with knowledge of personal finance may take an exam, which could count for a three-credit planning personal finance course. Learners can transfer in up to 75 credits for a bachelor's degree and 45 credits for an associate degree. 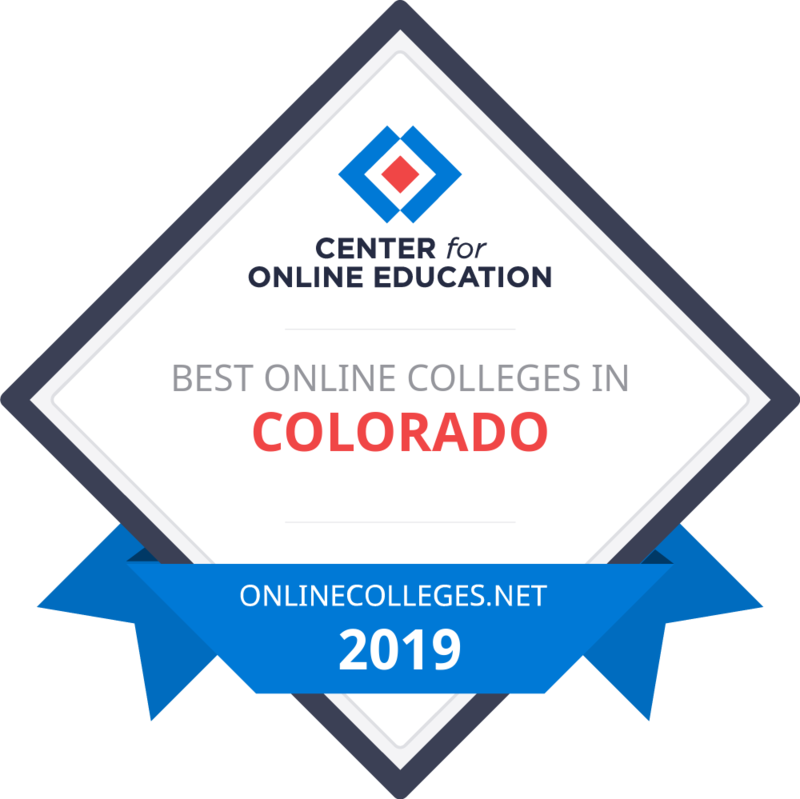 With regional accreditation from the Higher Learning Commission, CCU ranks among the best accredited online colleges in Colorado. Applicants must submit proof of high school graduation or GED equivalent completion. The application form differs for first-time college freshman and adult learners. Keep in mind that students from select states cannot enroll in certain programs. Located in Grand Junction -- a small city in the western part of the state, close to the Utah border -- CMU instructs around 11,000 students each year. With both liberal arts and technical programs, CMU aims to educate people from many backgrounds with various career goals. Students who want to take Colorado online college courses can find them here. The school's online programs help the university reach students who work full time or must tend to other commitments. In addition to the school's four bachelor's programs and one associate program, online students may pursue graduate certificate courses, master's degrees, and a doctor of nursing practice. Available bachelor's degrees include sport management, business administration with an emphasis in management, radiologic science, and elementary education. The education degree also prepares students for licensure. CMU holds accreditation from the Higher Learning Commission. Each program requires students to complete different amounts of credits. Education students must complete 126 semester hours, while sport management students need 120 semester hours. Students must spend 33-40 semester hours of coursework in upper-level classes. The education program also requires students to spend at least 200 hours in physical classrooms. The radiology program only accepts prospective students with associate degrees. If a student without an associate degree finds the program appealing, they can earn a two-year degree from CMU and then apply. Admissions requirements vary based on whether students apply as first-time freshmen, transfer students, or veterans. All students must submit high school transcripts or GED scores. First-time college students applying for bachelor's programs must provide ACT or SAT scores as well. Transfer students must demonstrate a minimum 2.4 GPA in any previous higher education coursework. Though its home campus is located in Providence, Rhode Island, Johnson & Wales operates three additional campuses in North Miami, Florida; Charlotte, North Carolina; and Denver, Colorado. About 15,000 students attend Johnson & Wales across the university's campus system. When the Denver campus opened in 2000, 325 students enrolled in its inaugural class. Now, over 1,200 students attend the Denver campus. Through its online college in Colorado, Johnson & Wales offers many different bachelor's degrees. Distance learners may study subjects like baking and pastry arts, digital marketing, and public health. The culinary arts and hospitality management make up a large part of the school's offerings. Johnson & Wales values sustainability in food production and cooking, and the coursework emphasizes sustainability and fighting food waste. The school also runs several bachelor's in business administration degrees, including management, entrepreneurship, and organizational risk and cybersecurity management. Courses count for 4.5 credits each, and students need 180 credits total to graduate. They must take general education courses in topics like English, math, and science, which usually add up to 63 credits. Students take remaining courses in their majors or through electives. Unlike the traditional two-semester system, the school follows a three-term schedule, with fall, winter, and summer terms. All applicants should possess high school degrees or a GED equivalent. Johnson & Wales does not list SAT or ACT scores in their admissions requirements. However, all undergraduate applicants must demonstrate that they've worked two years in a full-time position after high school. Prospective students applying to food service degrees in culinary arts, baking and pastry arts, and food and beverage entrepreneurship should possess an associate degree. Students can apply for scholarships, which renew every term. Johnson & Wales holds regional accreditation from the New England Association of Schools and Colleges (NEASC). Even though Colorado does not fall within NEASC's scope, Johnson & Wales' main campus operates in Providence, Rhode Island. The NEASC accreditation encompasses all four of the institution's campuses. CSU-Pueblo's campus may function as one of the smaller public schools in the state's higher education system, but its online programs educate students from all over the country. The school runs on three semesters in the summer, fall, and spring. Those semesters further break down into an A term and a B term. This allows for shorter, more intense courses in addition to six possible start dates for students throughout the year. Undergraduate students can pursue an online degree in construction management, or an online RN-to-BSN degree. Both degrees dictate that students earn 120 credits in order to graduate, but from there requirements differ. Construction management courses cover topics in construction safety, concrete and steel structures, and mechanical and electrical systems. Students can complete all of their courses at CSU, or they can transfer in credits. The RN-to-BSN program, however, offers a curriculum dedicated to nurses who want to return to school. This means students start the program with 33 credits through an articulation agreement. The college also offers an MBA for graduate students. CSU-Pueblo holds accreditation from the Higher Learning Commission. The school's nursing program boasts additional accreditation from the Accreditation Commission for Education in Nursing. In addition, the school's affordable tuition rates earn CSU designation as a cheap online college in Colorado. Undergraduate costs range from $350 to $382 per credit hour. Prospective students interested in the BSN-to-RN program should submit proof of an associate degree or diploma in nursing, in addition to a nursing license in good standing. They can transfer up to 57 credits from their previous degrees to the CSU-Pueblo program. Applicants to the construction program must submit a high school diploma. The school does not requires previous higher education experience, but the admissions department prefers it. Students with fewer than 13 college credits must also submit their ACT or SAT scores. The ranking below includes the best online schools in Colorado, sorted by affordability. 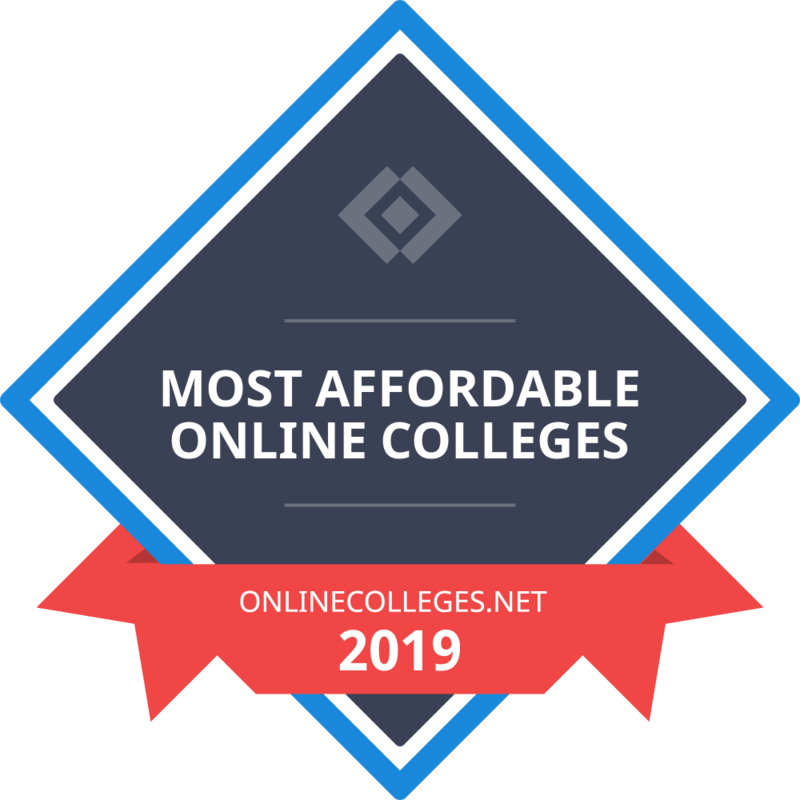 Our list of the most affordable online schools in Colorado is based on in-state yearly tuition, or annual tuition rates if a school does not differentiate between in-state and out-of-state students. Tuition rates are based on a full course load each semester or term. All colleges on the list offer at least one bachelor's degree completion program available entirely online. Those institutions with the lowest tuition are ranked highest, providing prospective students with a true list of the most affordable online colleges in their state. Graduates of accredited online colleges in Colorado can take advantage of the state’s healthy economy. As of September 2018, the Bureau of Labor Statistics (BLS) reported a low unemployment rate of 3.1% in Colorado — more than half a percentage point lower than the national average. Colorado also boasted a mean wage of $25.99 an hour — or $54,050 a year — for all occupations. This ranks higher than the national annual mean wage of $50,620 a year. Applicants must hold permanent residency in Colorado, be between the ages of 17-40, and primarily live in Colorado while attending college. Students must also demonstrate financial need and academic progress. Applicants must demonstrate financial need and hold ties to or live in Larimer County. They must also hold an interest in studying law or a related field. Applicants must be childhood cancer survivors and high school graduates from Colorado or Montana. Applicants must attend a Denver-area high school and demonstrate academic achievement and community involvement. Students must also be accepted to an accredited college or university. This is a $5,000, renewable, need-based scholarship for residents of Illinois, Colorado, Georgia, or North Carolina. Applicants must have a high school GPA of 3.5, and recipients receive mentorship and professional guidance throughout their undergraduate experience to build community leadership skills. Applicants must be children of a Colorado worker injured or killed in a work-related accident. They must also hold a minimum 2.0 GPA. Applicants must hold legal residency in Colorado, Wyoming, New Mexico, or Utah and demonstrate financial need. They must also belong to one of the following groups: nontraditional adult students, GED recipients, veterans, individuals formerly in foster care, or individuals formerly in the juvenile justice system. Applicants must hold legal residency in Colorado and attend a publicly funded, accredited school in the state. They must also demonstrate financial need and be graduates of high schools in the Eastern Plains area. Applicants must be students in Larimer County who face challenges pursuing a standard course of study — including individuals with a disability or a special need — or students who would benefit from training in art, writing, music, or visual arts.